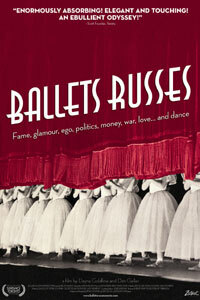 SYNOPSIS: The revolutionary 20th-century dance troupe known as the Ballets Russes began as a group of Russian refugees, who never danced in Russia, and became not one but two rival dance troupes. ‘Ballets Russes’ begins with the company’s Diaghilev-era in turn-of-the-century Paris — when artists such as Nijinsky, Balanchine, Picasso, Miro, Matisse and Stravinsky united in an unparalleled collaboration. The film then explores the company’s halcyon days of the 1930s and ’40s, when the Ballets Russes toured America and finally the company’s demise in 1950s and ’60s.